(CNN) -- Former California Gov. Jerry Brown returned to his state's highest office Monday -- restoring an old political dynasty while helping to usher in a new balance of power in statehouses across the country. Democrats took over from Republicans in California and Minnesota, while the GOP seized the reins in Wisconsin and Wyoming. One Republican handed over power to another in Nevada. Republican chief executives, meanwhile, kicked off their first full terms in Arizona and Utah. Another Republican began his second full term in Idaho. Across the country, Republicans and Democrats alike were taking charge at a time characterized by dire economic circumstances, and they are being forced to confront severe budget shortfalls in the wake of a steep economic downturn. Adding to the challenge in a number of states are skyrocketing fixed costs in the form of public sector pensions, health care and other benefits. Some of the most severe challenges are found in Brown's California, a longtime engine of economic growth now virtually crippled by a yawning budget gap estimated to be $28 billion over the next 18 months. 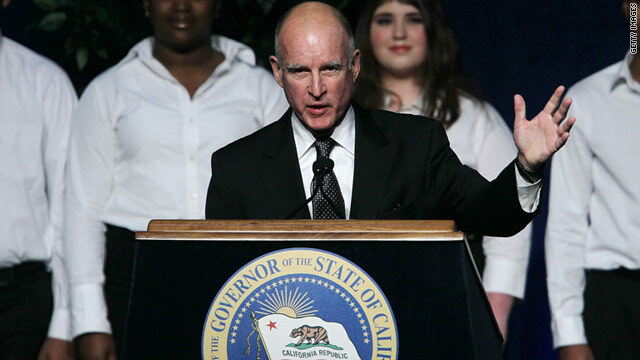 Brown, the 72-year-old successor to former GOP Gov. Arnold Schwarzenegger, has been meeting with state officials and legislators in recent weeks to seek remedies. Brown previously followed Ronald Reagan in the governor's office, picking up the nickname "Governor Moonbeam" during two terms from 1975 to 1983. His father, Pat Brown, served two terms as governor from 1959 to 1967. The new governor chuckled when asked during the administration of his oath of office Monday if he accepted the position "without any mental reservation." "Really," he said. "No mental reservation." Schwarzenegger, in his final weekly address before Brown's swearing-in, said he was leaving office with his head held high despite the state's recent troubles. "I came to California four decades ago with absolutely nothing," he said. "Because of this state welcoming me with open arms, I gained absolutely everything. ... The opportunity to give something back as governor has been an immigrant's dream come true. "History will be the final judge of my administration's record," he added. "But I leave office proud of what we have accomplished." The Republican governor and movie star ended his time in office -- as many governors do -- by granting a series of pardons and sentence commutations. One that sparked controversy involved the son of a former Assembly speaker. Esteban Nunez, 21, had been sentenced to 16 years in prison for his role in the 2008 stabbing death of a college student. The governor cut the prison term to seven years. In a statement, Schwarzenegger said Nunez's role in the incident had been "limited" and that he had no prior criminal record. Meanwhile, in Nevada, Brian Sandoval also prepared to make history. The Republican former state attorney general was set to become Nevada's first Hispanic governor. In Wisconsin, Republican Scott Walker, a Tea Party favorite, took over from retiring Democratic Gov. Jim Doyle. In Wyoming, Republican attorney and rancher Matt Mead was set to take the place of Democratic Gov. Dave Freudenthal, who was limited by state law to two terms. And in Minnesota, Mark Dayton became the first Democrat in two decades to assume office as governor. Minnesota's was the last gubernatorial race to be decided. Dayton's narrow victory allowed Democrats to hold onto a 20th statehouse. The GOP has 29. The 50th governor is independent Lincoln Chafee of Rhode Island. Several other governors have also taken office in recent days. On Saturday, Democrat Andrew Cuomo became New York's 56th governor, while Republican Susan Martinez took the oath of office in New Mexico, becoming the nation's first female Hispanic governor. Former health care executive Rick Scott, a conservative Republican, is set to replace Gov. Charlie Crist, an independent, in Florida's top office on Tuesday. Chafee, a former senator, will take over from GOP Gov. Don Carcieri in Rhode Island.